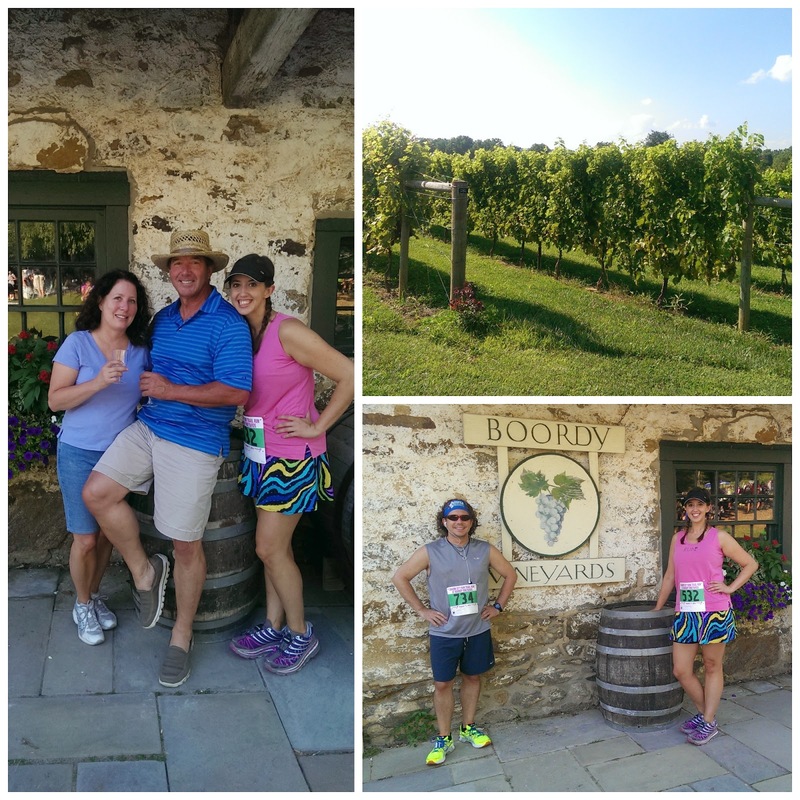 Earlier this month, Matthew and I ran one of our favorite 5ks- the Charm City Trail Run 5k at Boordy Vineyards. We ran this event last year and had a great time so coming back was a no-brainer. As I've mentioned before, Charm City Run is my favorite running store and they produce quality events- we always try to make it down to Baltimore when they're having a race. This race takes place on a Sunday evening; I believe this was the fourth or fifth year. It can only accommodate 800 participants and it sells out early every year. 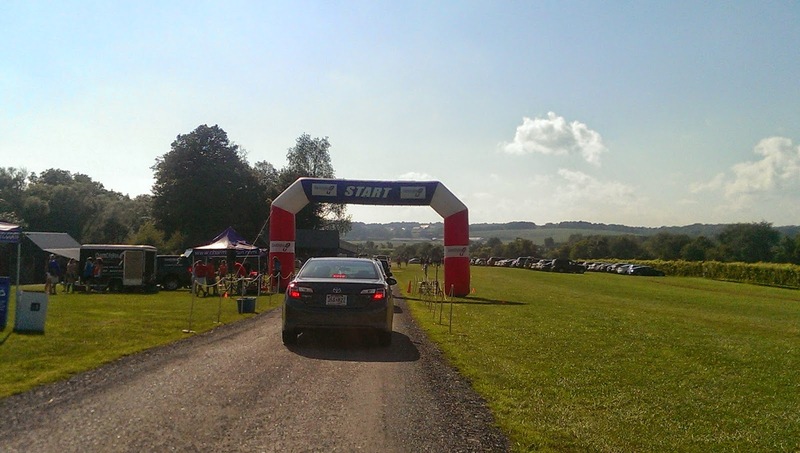 Matthew and I arrived to the vineyard around 5:00 pm and had no problems with getting parking near the start line. We actually drove under the start/finish line which was kind of cool. At around 5:50, we headed over to the start line. Since we knew this course, both Matthew and I felt pretty confident that we could run a good race. 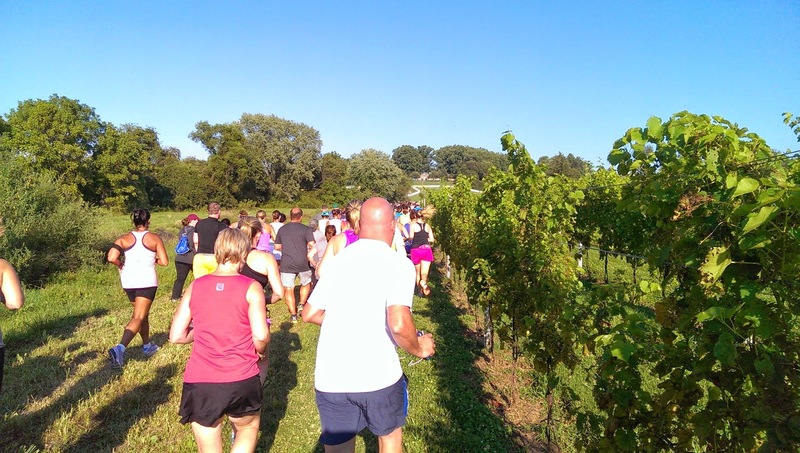 The first quarter mile was in the vineyard, then we ran out onto the road and went down hill for about a mile, and then turned around and came back up the hill and back into the vineyard to finish. However, what I don't remember about this race was it being so crowded! Especially in the narrow and unstable grassy areas of the vineyard. Maybe I started too far in the back of the pack this year, but it was pretty miserable for the first half mile. Narrow... but a beautiful view. Now because I knew this route, you think I would have saved up some energy for the last uphill mile aka "the death march." I didn't. I ran the first two miles in just under 22 minutes- under an 11 minute/mile pace. The last mile was closer to 13. Whomp, whomp. I finished in 33:25. About 30 seconds away from a PR but still 30 seconds faster than this race last year. I'll take it. Matthew finished in 28:21- he's speedy. And he did it using regular run/walk intervals; usually he just walks when he needs to but he's been successfully trying out regular intervals like a rock star. 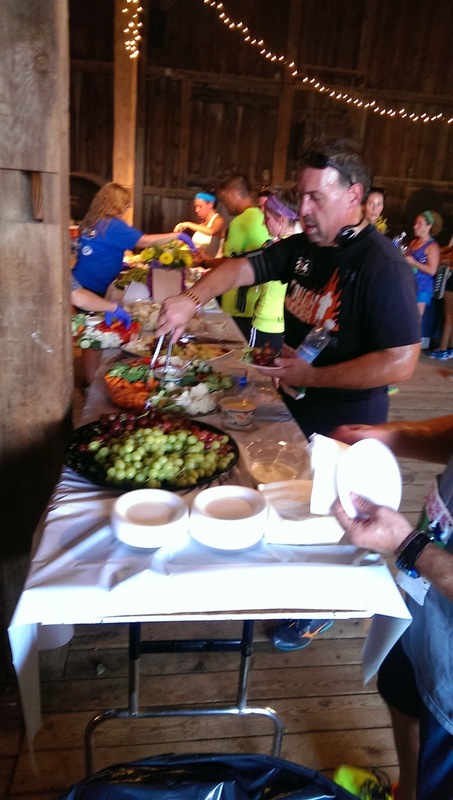 After the race, we headed into the barn to grab some free food and drinks. They had an awesome spread of veggies, crackers, hummus, cheese, and fruit. I also bought a bottle of the Vidal Blanc and enjoyed a fabulous glass of wine. Turning back into the vineyard for the last quarter mile. All in all, this is a great race and is totally worth the entry fee of $40. We ended up hanging out for about an hour after the race just enjoying the band. 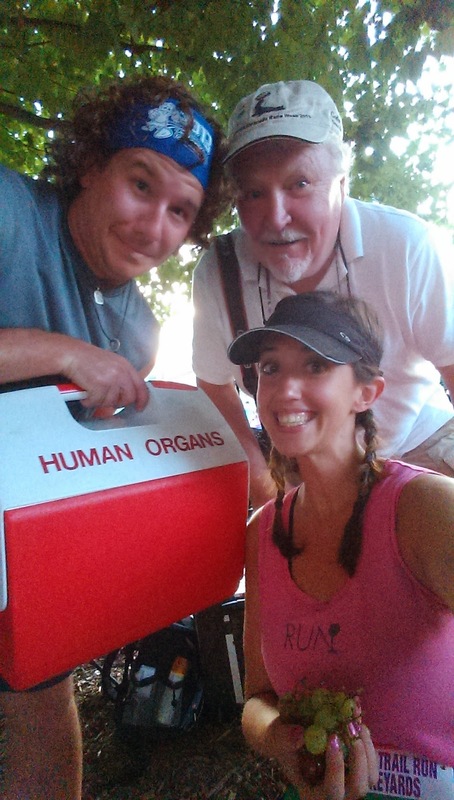 We also met a man who wanted to photo bomb us with his cooler. I think he'd had quite a few glasses of wine! If you're ever in the Baltimore area in mid-August, definitely check this one out. 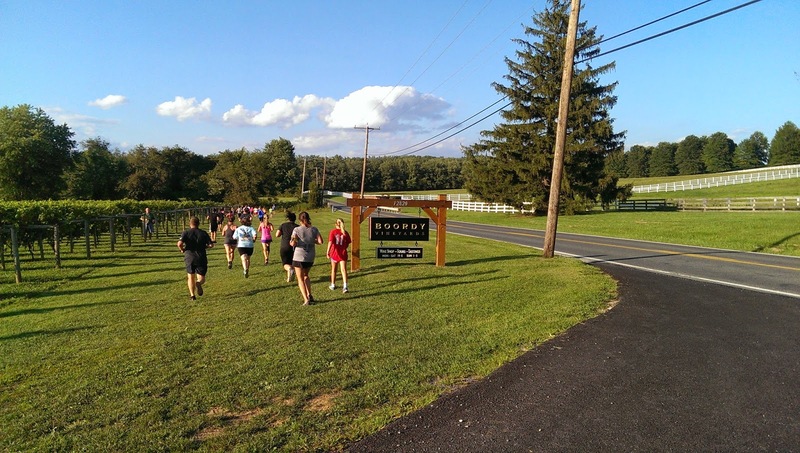 QOTD: What's your favorite 5k? What makes it awesome? Veggies, fruit, crackers, hummus, and wine after a 5K sounds awesome!!! This sounds like an incredible race! I'll definitely have to keep my eyes out for when the 2015 details come out! Excellent! We registered in March this year so I think details come out around then. My favorite 5k is the Jingle Bell race here in Wilmington NC in December. Lots of the runners dress in costume, in fact they have a costume contest with prizes. Last year, a group did a full nativity scene that was amazing. Another group did the Grinch and a bunch of other characters from that story. Really fun! I think I remember seeing some photos of this on your blog! I really like the nativity idea for a group- super clever! J&A Racing Ambassador 2014- 2015: I'm in! I am an Enell Ambassador!